Win New Outfit in Lunar Festival Event! The Lunar Festival is coming! Let’s celebrate the New Year of the Chinese lunar calendar in game! 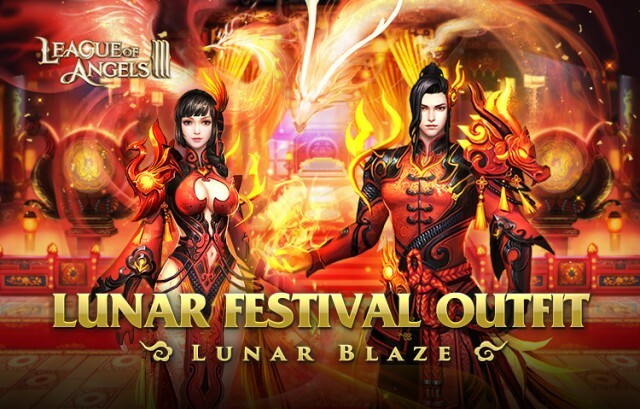 From Feb. 4th to Feb. 8th, all players have the chance to obtain the fantastic new outfit – Lunar Blaze. What are you waiting for? Just press play and win great rewards! Lunar Festival is the holiday preceding the new year in Sapphire Planet. During this month, all creatures will go through a period of rebirth. The Lunar Festival is also known as the time of blossoming spring. In order to dispel the cold winter winds and welcome the warm spring, people living on Grace Continent will put on new outfits with adorned with bright red colors bright as flame. They ignite bonfires, hold parties and eat special food to celebrate the Lunar Festival. In this grand festival, people pray for warmth and new life for Grace Continent and hope that the Lunar Blaze can provide life for all creatures. Use your Spring Festival Tickets and Topaz to spin the machine and you’ll be able to win a ton of items and exclusive tokens like String of Firecrackers and Firecrackers, and even more Spring Festival Tickets. The 2X, 5X rewards will be come out with a rate, so wish you good luck!! Lunar Blaze is an outfit with traditional Chinese elements. The overall color is mainly red and patterns such as Auspicious Clouds can be seen hewn on the cloth. A Chinese knot was also added as a special accessory. The female outfit style originates from the cheongsam. This is a type of dress traditionally worn by Chinese women with a high mandarin collar, a split skirt, and a fitted bodice with an asymmetrical closure extending from the neck to the right underarm, made for females to look elegant and graceful. The outfit also includes embroidered shoes and a hairpin. The male outfit was adapted from a traditional long gown with a matching Chinese jacket and boots. Using String of Firecrackers and Firecrackers to buy rare outfits like Silverfrost Armor, Holiday Vestments and Frozen Armor and plenty of great items in Party Specials. Once the outfits are permanently activated and certain requirements are satisfied, you can also obtain String of Firecrackers besides spinning the machine. We wish all players enjoy the Angel’s Carnival and have fun in League of Angels III!